Filling: In a 12-inch nonstick skillet, heat the oil over medium heat. Add the green beans, celery, shallots, salt and pepper. Cook for 5 minutes, stirring frequently, until the vegetables begin to soften. Add the kale and wine. Stir until the kale wilts, about 3 minutes. Stir in the pine nuts and cranberries. Topping: In a small bowl, whisk together the yogurt, agave, lemon juice, coriander, cumin, salt and pepper until smooth. Assemble by spooning the filling into the center of each socca. 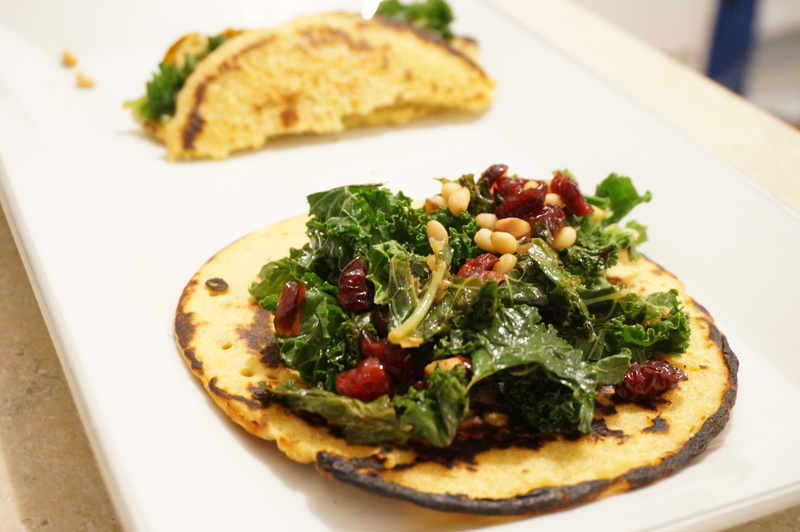 Roll up the socca to encase the filling (or fold it over like a taco!). Spoon the topping on top and serve. Any other gluten-free bread substitutes to share? ?